Palm has announced the winners for their first Hot Apps competition, where they gave away a total of one million dollars to webOS developers based on download count, split between paid and free apps. 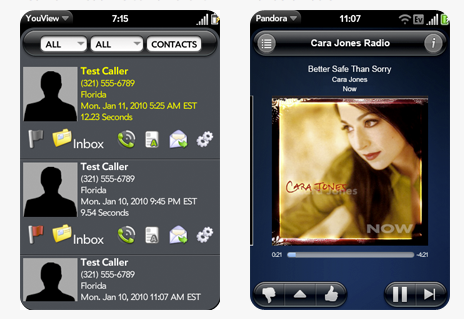 The top winners were Pandora and PC-favorite YouView visual voicemail, each receiving $100,000. After that we have a bunch of developers we know and love at PC taking $10,000 prizes: Absolute Fitness, Crosswords, Flashcards, FlightView, Golf Caddie, GolfPinFinder, IM+, iStayFit, jVault, My Home Keyboard, MyQ for Netflix, Paratrooper, Pink Pad, Safe Box, SMS MMS Emoticons Pro, SplashID, Twee, Tweed, What's for Dinner, and WiFi Media Sync. Free apps winners, who also won $10,000: AccuWeather, All Games Free, Backgrounds, Balloon Pop, Block Breaker Lite, Bubbles Free, Destroids, Dictionary, Emoticons Free, Flashlight, Guns of War, Kamasutra, Mazer, Paintr Lite, Party sign, Photo Effects, RadioTime, Helicopter Game, Weather Channel, and Topple Ball Mini. That, friends, is a lot of apps and a lot of winners - pretty much all of which we think are great apps. The list of $1,000 winners is even larger. Congrats to all the developers who won cash in Hot Apps. Right now we have another one million dollar competition, the PDK Hot Apps competition for apps with utilize Palm's Plugin Development Kit for 3D gaming.